A good money saving tip is to trade services with locals in your area, family friends etc. Each take a turn cooking one day a month, babysitting etc. It really saves money, time and energy and makes great friendships! These are such great tips! I am passionate about this and write about it a lot on my blog. To take your idea of making sacrifices a little farther, we discussed the things we enjoyed doing or having that cost money and found alternatives. We have learned to find cheaper or free entertainment. I have learned to cook our favorites at home. Mostly, we have learned to make do with a lot less and we find that we are just as fulfilled because we are happy to be together. Thanks for the encouraging post! We lived on one income our entire marriage, though right now we both have jobs, we plan to only "use" one of those incomes to live on. You can have a lot of fun in life without buying into the belief that you need to buy a lot of extras. I think our biggest money saver is that we just really don't buy things we don't really need. I think it's very wise to live on one income and not worry about what the culture says. Have a great night and thanks for stopping by! Great tips!! I agree with every single one. We've been on one income the last 11 months and while it's been hard in some ways, we've really done well managing with what we have. I value being home with my daughter so much more than having a shiny new car! Thanks for posting! Perfect list. When I decided to stay home giving up the second car was a must! We rarely buy anything these days without a discussion and a few weeks (or longer) to save for what we need/want! 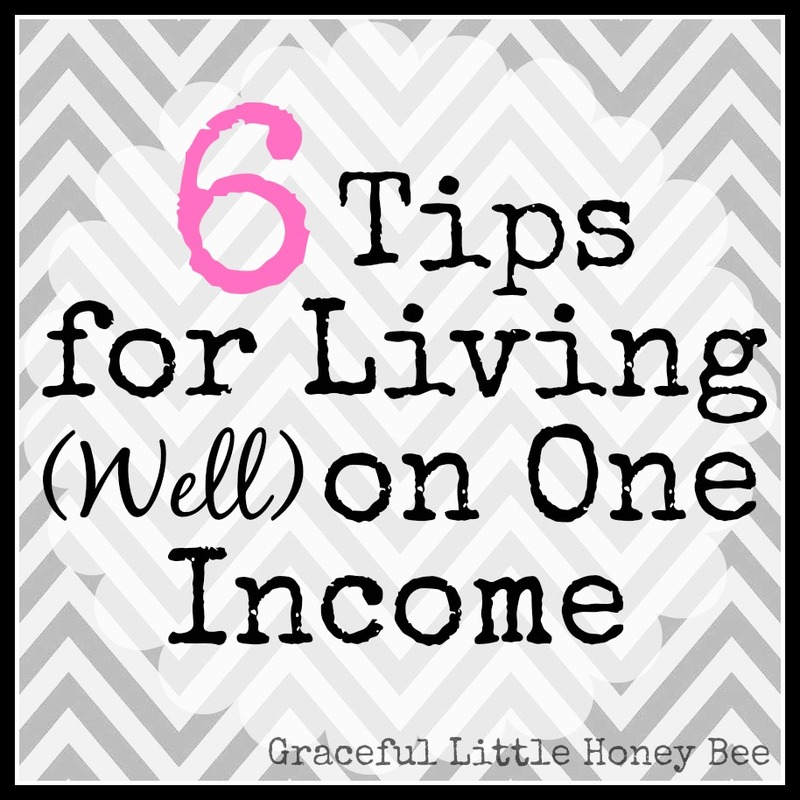 I feel like it may be work living on one income but it is so worth it! We have been doing it for almost 4 years and can't imagine doing it any other way! Your right it takes effort to live on one income when the rest of the world seems to be doing the opposite! Once it becomes habit though it gets easier. Thanks for stopping by! Patience is a money saving tip I am working on! We don't need what we want right now. As a matter of fact, if we wait a bit, we may find we don't want it at all;0) We also look for ways to have fun for less! Yes, patience is a great tip. Normally, if I can wait 48hrs before buying something I talk myself out of it! I would also add pray for God's provision! He is always faithful to take care of his own. You never know how he will make something work out when the budget gets tight. Great one too add! God always seems to work things out! We committed early in our marriage that we would live off of one income so that when kids come, the adjustment to me staying home would be easy. Our first is just about 3 months and I am glad we don't have to cut back now, we are use to it. I just bought a 20 pound bag of rice today! We have been eating a lot of rice recently to make this stretch. Better than pasta for us! And that huge bag was only $9. Not too shabby. Great tips! I think living off of one income from the beginning is so wise and I'm sure you're thankful now that you chose that path! Hi Missy. I love the tips. Thanks for sharing. I try to implement as many ideas as I can to keep us living on one income. We went through Dave Ramsey's Financial Peace class and paid of a lot of our debt. The relief we felt was almost immediately. I would also add that making and sticking to a budget is VERY important!! Great tips. It can be a big adjustment at first but totally achievable. Shopping around is good too, for utilities and services to find a lower price for the same services. Great foraging tips! A lot of fruit goes unpicked these days simply because people aren't looking for it and they prefer the "pretty" looking stuff from the stores. Sounds like your larder is full! Thanks for commenting! I love these tips. I have made the decision to stay at home with my kids because I know how important it is. I would feel bad going back to work just so I can afford that new boat..you know? I want to commend and encourage you ladies that are striving to manage on one income. When my children were young, I also made that a priority. You just have no idea how valuable those skills may be later in life. A spouse's illness, care for an aging parent, the desire to help with grandchildren...many things may come up that make you want to live on one income again. These are life skills you are learning and passing on. They give you options. Thank you for your wise words of encouragement! So glad I found your site. Love it! Such a good time for me. God bless you! Even if you want to add to your family, it's probably not something you have to do immediately. (I realize you replied 3 years ago, but this goes for anyone in a similar position.) In fact, it's kind of nice to spend some time as just a newlywed couple before adding sleepless nights and big bellies into the picture. (Can you tell I'm pregnant right now? :D ) We waited one year and then had some bad luck for the next 8 months, but the timing was perfect. He just got a promotion at work, and his little brother is in his final months of school. (We're paying for his education; I sometimes joke that my brother-in-law is our eldest child.) So, unless you're over 35, it's not a bad idea to take some time to work and pay down those debts before having children. Also, consider an inexpensive wedding. We made a lot of economical choices for our wedding which maybe didn't result in anything you'd see on Pintrest but included the important thing: getting married to the love of my life. The whole thing cost us about $1,000. (We calculated it out that the actual cost would have been around $2,000, but we bartered for some services and other people offered their services as a wedding gift.) We did a lot of the decorating ourselves with the help of a couple family members and a friend. Lots of people go into *huge* amounts of debt on their weddings. Cheap food doesn't have to be boring like potatoes,soups and homemade breads. East Indians, Middle Eastern and Asians spend much less on food without resorting to tasteless potatoes, soups and homemade breads as Ma Ingalls did. There are recipes with lentils, chickpeas, spinach etc that are very tasty with the addition of very inexpensive herbs and spices such was garlic, cilantro etc. I think you may have misunderstood my use of words. When I said simple I was referring to wholesome and homemade. I definitely don't think frugal has to mean boring and tasteless. You're right herbs and spices (even in soups and breads!) are an inexpensive way to add tons of flavor and should definitely be utilized in frugal cooking. I stay home a lot. We go to parks and cheap places for entertainment. I've cut back a lot on fast food... it helps a lot. I don't drink fancy coffee or buy fast food soda anymore. That saves hundreds per month, when you add it all up. My sister in law price matches at Walmart. She gets their groceries for $150 every two weeks. We also don't use a lot of meat. It's never the main course. I mix it in with pasta. I have been a SAHM for 20 years and our youngest is going to college this fall. We have absolutely zero credit card debt b/c we choose not to - is it hard? Sure, but we figured it out. One important thing to remember is entertainment - and date nights for the parents. It is amazing the number of things you can find on the internet and your local chamber of commerce of free things to do in your area. Pack a picnic and go and enjoy free or low budget destinations. Or? Stay at home and have the movie night or a game night. You would be surprised how much your kids and husband/wife love these types of ideas. Life isn't cheap - no doubt, but you don't have to keep up with neighbors to be happy. None of us have ever watnted for anything - yet we manage just fine. Not bragging, mind you, but I think credit to have "things" is a great downfall of our society. Have what you need but don't pay interest simply to get the things you want. We have been living on one income for years. My husband was in a career that didn't pay much, but he took online classes (while working full-time) and got a better job. He learned new skills and got experience and better pay. Until recently we had one vehicle. When I wanted to use it during the week day I simply got up early and took my husband to work then picked him up. We now have two used, paid-for vehicles. There are lots of cheap or free family fun ideas- fly kites, parks, picnics, hikes, the library has lots of free activities for kids, storytime, rec center classes, game night, invite friends over, cookouts, bike rides... Instead of a vacation we do day trips or overnight camping trips. It did take a while to collect the camping gear, but by slowly building up we have learned what we need; like sleeping bags, and it was only a little bit of money at a time. Now that we have almost everything we need we will only pay for food and the camping fee, which is under $20 a night. I shop clearance sales for the kids' b-days and Christmas all year long. I know what they like and when I see it marked down I get it. Also memberships to local museums and National Parks make good gifts. I completely agree! Living in an expensive area, our families didn't think we could make it on one income. We proved them wrong and made it go right for me to stay home with our little ones. Other things that have worked for me are: calling our phone provider, Internet provider, etc. and requesting lower rates. Most were able to work with us. We also take full advantage of our public library. Ours offers free access to lots of local museum - a huge savings!